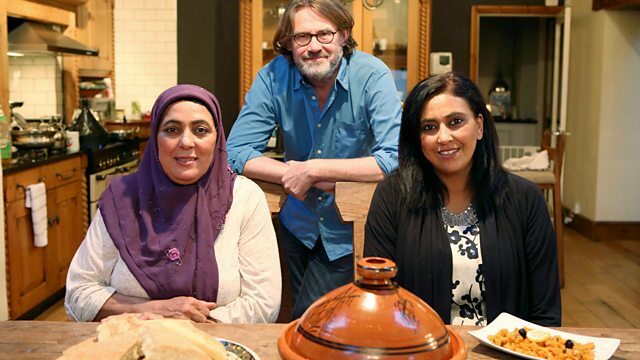 Food writer and cook Nigel Slater takes a tour of the diversity in modern British home cooking. Nigel discovers the charm of a traditional Moroccan lamb tagine. Nigel's delicious tour of modern British home cooking takes in iconic dishes that bring people together. He heads to Trowbridge, Britain's largest Moroccan community outside London, to discover the charm that draws Moroccan families around a traditional lamb tagine. He gets a lesson in the art of pairing spices for a fabulous Indonesian fish dish and meets Zoe, who shows him how to make jollof, Ghanaian style. Nigel creates a slap-up Sunday roast pork belly and shredded duck with spiced flatbread. See all the sharing dishes from Eating Together - episode five.